As you learn about designing and installing a solar system you also have to learn about the electrical services. Here is a break out of some of the common electrical services found in the United States. Think of the electrical service either as the primary service the utility provides to a location but it can also be a service created with a transformer located inside of a commercial facility. This is the most common electrical service in the US as it is the service used in the typical residential home. Line 1 and Line 2 are considered the hot wires in the service. The neutral is bonded to ground. The voltage from Line 1 to Line 2 is 240V and this is used for larger loads in a home like an electric hot water heater or air conditioner. If you look at your homes electrical panel these are the larger double pole breakers. 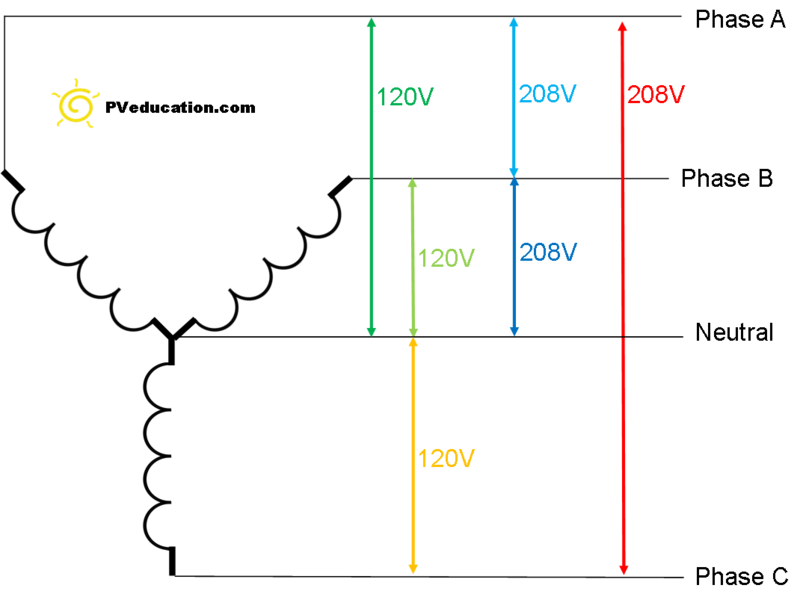 The voltage from Line 1 or Line 2 to the Neutral is 120V and is used for smaller loads like lights and outlets. This electric service is the most common electric service in the US at commercial properties. The 208V 3-phase is used to power larger loads and standard 120V is available for outlets. The title of this service is a little redundant as this service is often referred to as a 3-phase 208Y120. Wye is pronounced as “Y” and denotes that there is a neutral in the service. This electric service is found in larger commercial and industrial facilities. 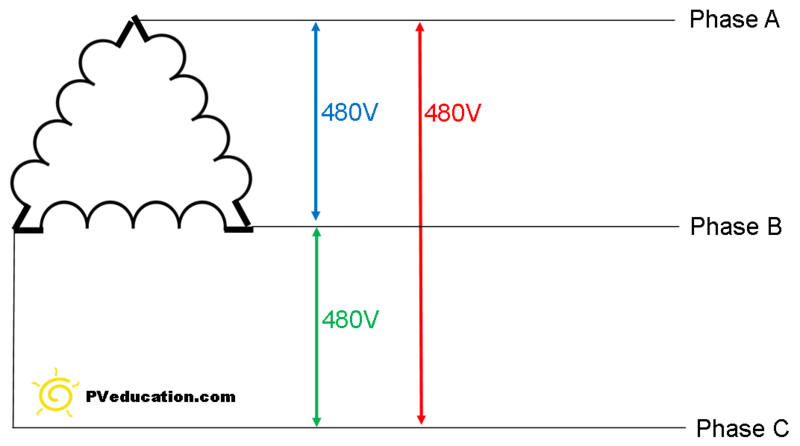 The 480V 3-phase is used to power large loads like motors. The 277V is often used for lighting circuits and smaller loads. When this is the primary service to a facility you will typically find a transformer that is a 480V Delta\208Y120V that power a sub panel to provide standard 120V for outlets and small loads. Inside of commercial and industrial facilities motor loads will typically run on a delta service. As you can see from the above there is no neutral in a delta service. 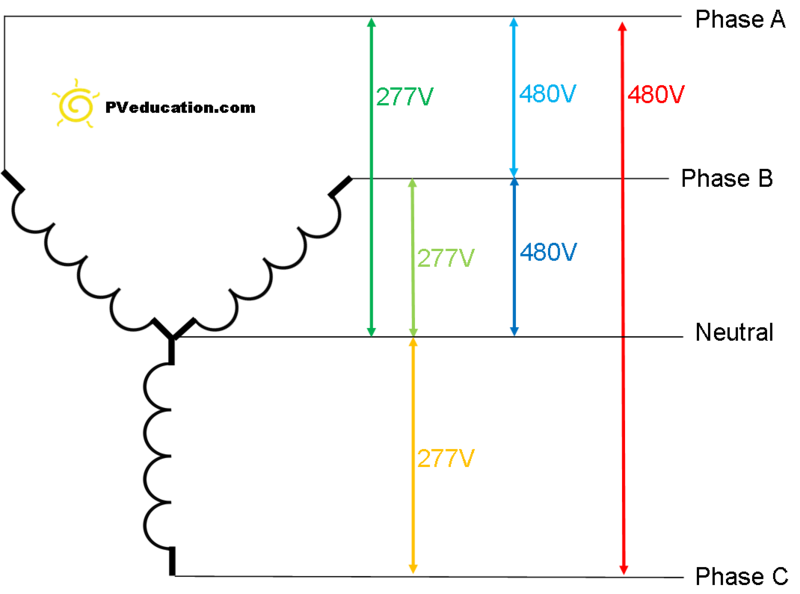 I used 480V as the voltages above but these can be any voltage, 240V, 400V, 480V, and 600V are all common transformer voltages. This service is thankfully less common than all the others found above. This service is common in older facilities that only have small 3-phase loads. It costs the utility less to supply this because only 2 transformers are needed on the utility pole. If you run into a service like this you have to be very careful with your solar system design. 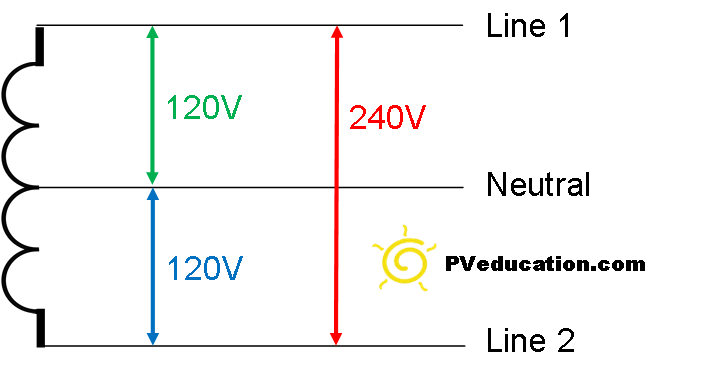 It is not uncommon for solar grid connected inverters to require a neutral connection on their output. If that is the case this inverter will check voltages not only phase to phase but also phase to neutral. 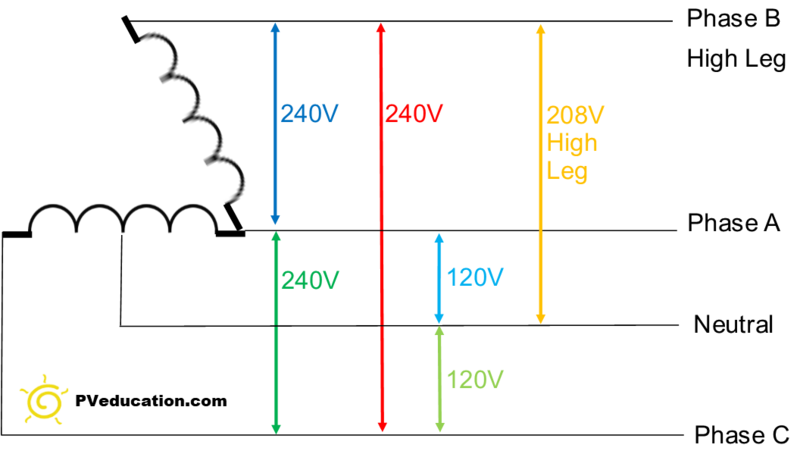 As per UL there is a tight voltage tolerance allowed so the high leg will prevent the inverter from ever starting. Some 3-phase inverters have a design that doesn’t require a neutral connection and these can be used. Another solution for small solar systems is to use a single phase inverter connected to Phase A and Phase C, this avoids the high leg and it till operate. If the system is larger using a 3-phase inverter is best, typically these inverters start at 15kW in size so if you can find one that will operate 240V 3-phase Delta this might work. I purposely say might because you have to check with the utility. If you can locate the transformers on the utility pole you will see one is smaller than the other and depending on the service amp rating provided this can be a limiting factor for a solar system maximum size. In some cases the utility may force a third pole mounted transfer be installed to turn this into a more standard 3-phase service type. If this is the case, it is typically because the utility is concern about balancing the output power of the solar system on their network. When completing a site assessment before you even enter the property try to locate the electrical service and look up for pole mounted transformers. If you see only two this is an indication there is a high leg. Also count the over head utility wires, are there three at the top of the pole? In some rural areas the utility may only string one or two wires at the pole top. If there is one the service is most likely single phase and if two there is good chance there is a high leg. Another indicator is the circuit breaker panel as it should be labeled that there is a high leg inside. If there is no labeling but you see the single phase breakers skip around and there are a lot of skipped unused spaces, there is a good chance this is a high leg.